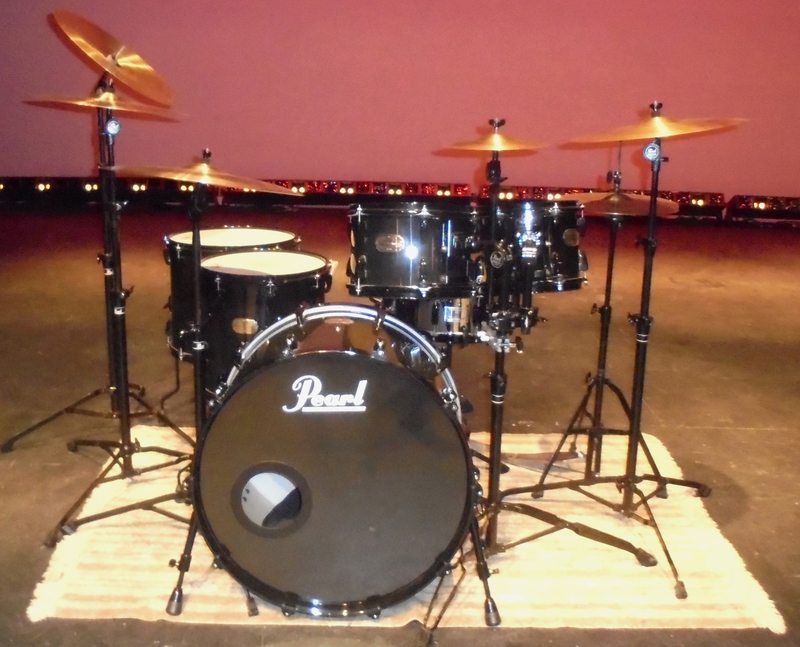 When I graduated from high school, I was given a drumset as a present. I had been hoping to play drumset ever since elementary school, but never had the opportunity. I took off on that drumset. I played with co-workers and friends in a cover band once a week. As we played more and more, I added cymbals, replaced the cheap hardware that fell apart as I played, and gradually just started building an entirely new set. Within a year, I decided I had "graduated" from that first set (which cost about $200, as I recall) and set out to order a new one to meet my refined, discerning tastes. 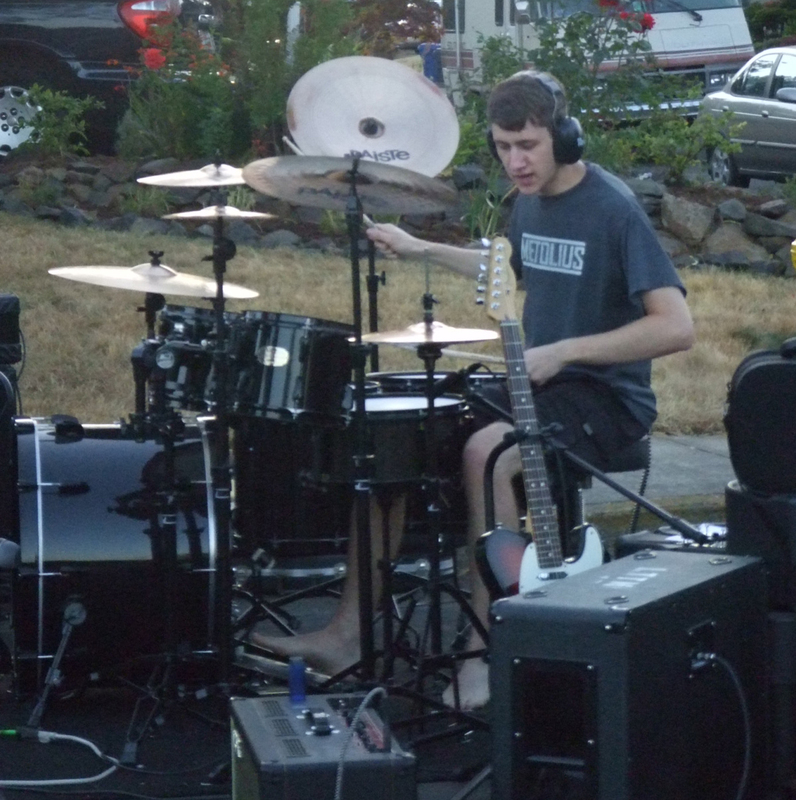 Although I really only had experience playing that one set of drums, I knew exactly what I was after. I listened to every CD, watched every video, and studied drum construction. It's what led me to this drumset. I called up a drum dealer and ordered a Pearl SMX set in the color called Carbon Mist, which is a semi-transparent black. All in all, it was about $1500. 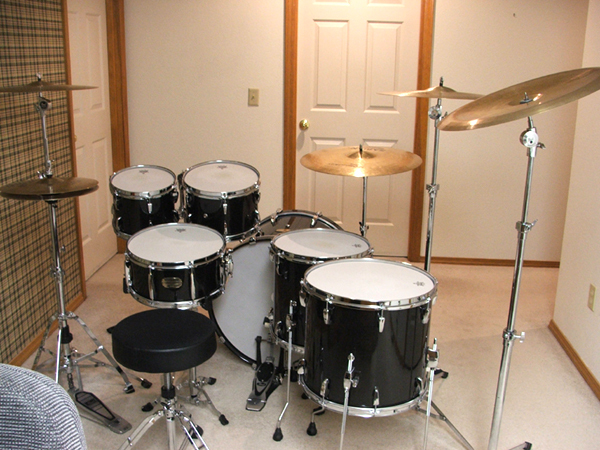 It was a big purchase for me at that time, but my intent was that this drumset would last me forever. Now that I've had it over a decade, I think it will. 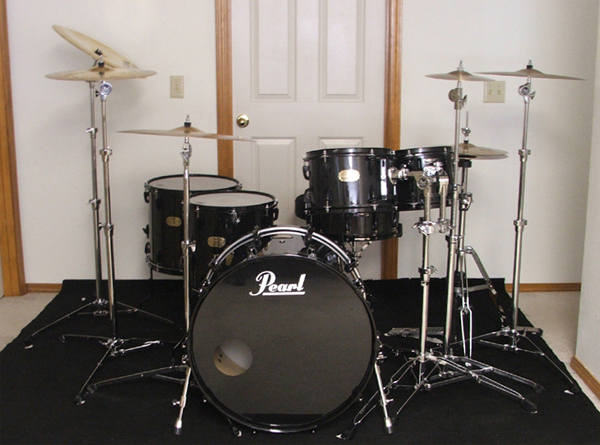 The Pearl SMX is an all-maple drumset, which is important. See, there's a lot of research about what effects the type of wood has on sound, and drums can be made of birch, luan, mahogany, etc. The truth is, there are so many factors with drum sound, I don't think it really matters all that much. But, maple is sort of the "standard" professional wood. It has long been used and accepted as a wood of choice for drums. So, for me, I wanted to invest in what I could be sure was a "professional" level set. It had to be all maple. The Pearl SMX was a very reasonably priced all-maple set. Oh, and I wanted Pearl because my drum hero plays Pearl. Not going to make up anything about that. One thing I like about these drums is the hoops. More expensive drums tend to have die-cast hoops, which I briefly lusted after. It would be possible to buy such hoops and replace the ones on my set. However, I have come to love the triple-flanged hoops on my set. Die-cast hoops weigh a ton and give the drum a "harder" sound and feel. For awhile that is what I wanted, but I prefer the softer, rounder sound that I get from the hoops that came with the set. Like maple, these hoops give a more classic sound. A very overlooked part of the drumset is the various tools that you can hit drums with. Even if you use only normal drumsticks, non-drummers would be shocked by the variety available. All of which will make you a better drummer, by the way. There are many nice sticks available in the US, but naturally I take the expensive route and import drumsticks from Japan. I will say their exact specifcations are somewhat unique and I haven't found a close match in the US. However, mostly I buy them because they are the signature stick of my drum hero, Sakurazawa Yasunori. They're a very pleasant stick. Average length, circular tip, and best of all, made of maple. Most drumsticks are made of hickory because it tends to be a bit heavier and break less easily. However, even if my bandmates don't believe me, I am not a very hard hitter, and I rarely have problems with sticks breaking. Maple is nice because it's a bit lighter, which makes them seem a little faster. Another overlooked, but important, part of a drummer's arsenal is his/her bass drum pedal. 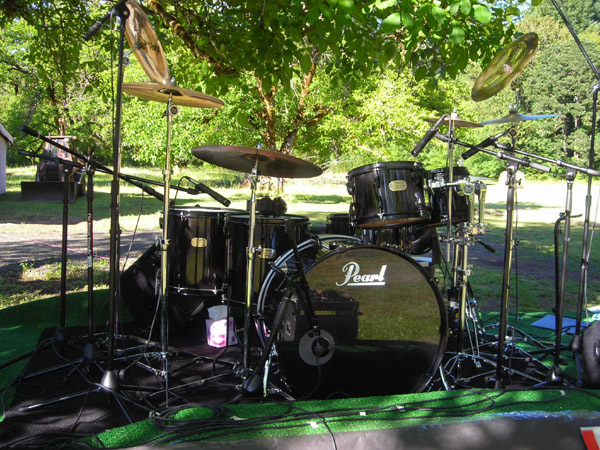 Many drummers, especially those with double pedals, will take their pedals along with them even if they are playing somewhere that provides a drumset. For one, you can never count on the quality of what's available there, but also you develop a very specific feel with your pedal. Your right foot stays busy on that thing! I use a Pearl Eliminator. Many years ago when I bought it, it was the most expensive one Pearl offered. What's great about it is that it is highly configurable. There are a million different customizations with these pedals. At first it was almost overwhelming, but with certain customizations, you can feel right away which you like best. Even up through today, I still occasionally tweak the settings. I often switch around the cams, for instance. Anyway, this pedal almost feels like an old friend at this point. There's a heel mark even. Finally, I also included a picture of a few other tools I use to hit my drums. 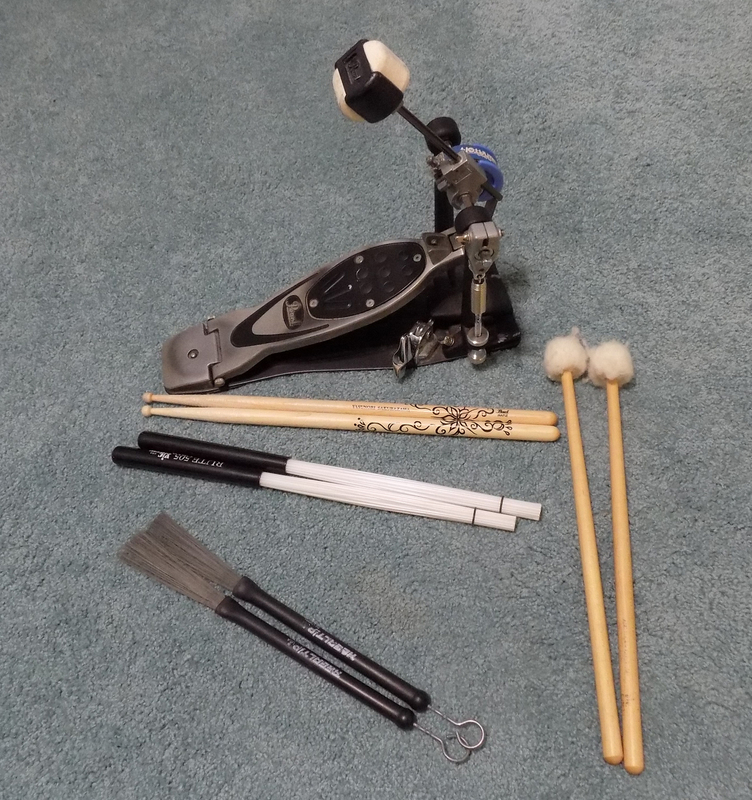 Back when I played in a rock band, I mostly just used regular drumsticks and used these rutes, brushes, and mallets for effects occasionally. But since then, I've played in a number of situations which call for lower volumes and a variety of sounds. Both my mallets and rutes have seen a lot of use. They produce a much lower volume sound than sticks. Admittedly, I am a total novice with the brushes, and they still don't see a ton of use. Unlike most other parts of my drumset, none of these models were chosen for any particular reason. They were all recommended as "general purpose" so I went with them. Ah, snare drums... every drummer loves snare drums. They all sound the same to non-drummers, but for us, there are millions of options. They are struck far more often than any other drum and provide a large part of a drummer's "signature" sound. 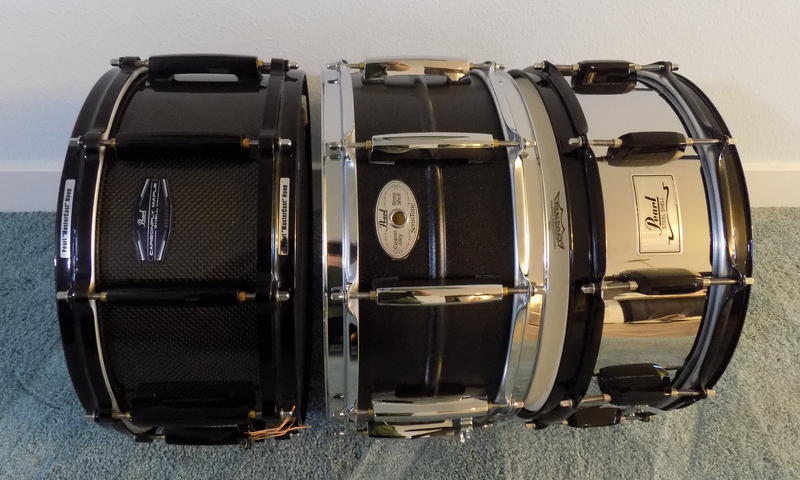 It is for that reason that I've owned nearly 10 different snare drums in my life. On my third trip to Japan I picked up the snare drum I lusted after for a long time: the Pearl Carbonply Maple snare drum. I was interested in the Carbonply Maple drums but they were sold exclusively in Japan. Many top artists used them and it seems strange that they never caught on here. The shell is made of maple as the name suggests, but there's a layer of carbon fiber on the inside and outside of the shell. This is my "go-to" snare. The wood shell is much mellower and not as bright and ringy as a metal snare, but the die-cast hoops give it just a little more aggressive bite. I feel like it has a modern, dry sound. It seems like it would be suitable for a wide range of styles. When drummers think of Led Zeppelin's John Bonham, everyone knows he used a Ludwig Supraphonic snare for just about everything. It is his "signature" sound. Stewart Copeland was famous for his brass snare tuned stupidly high; that was his signature. Even though I am not on their level of fame or playing, I'd like to think that I could have a "signature" drum with my Carbonply Maple snare. It's a rare drum on this side of the Pacific and I've used it for nearly everything. It's been very reliable. The first snare drum I ever purchased was this Brass Sensitone. I bought it when the snare that came with my $200 set fell apart. I wanted a metal shelled drum, and brass is considered a "higher quality" metal than steel (although, having experienced both, I disagree.) So I got the Pearl Brass Sensitone. I spray painted over the ugly brass coloring and made it a nice gloss black with light sparkling. I left the hardware chrome, whereas the rest of my kit has black hardware. I wasn't so much trying to copy the look of a Black Beauty, which you might be expecting, but actually more of the "Blacrolite" look. I owned one and really liked its looks. In addition to the spray paint job, another customization I made was to swap to 1.6mm hoops. These are thinner than the hoops Pearl stocks these with and are normally found on low-end snares and drumsets. What can I say - I prefer the sound much more now. The rimshots aren't as earpiercing and, in general, they seemed to mellow out the drum nicely. It's still bright and loud, but just a little tamed. Being a big, lively drum, even with the thinner hoops, the sound of this brass one seems suited to loud rock music. A lot of fuss is made over boutique snare drums. The working drummer sees them for what they are: beautiful, but not practical. Any sound advantage will be washed away in the noise of a band, and taking such an expensive item to a show seems bound for trouble. With this in mind, I decided I wanted to see what I could pull out of a really cheap snare. What I wanted was a 5.5" depth, 10-lug steel snare. This Pearl one fit the bill, and I think I paid around $60 for it. Unsurprisingly, with good tuning, and appropriate hoops, this could create a really workable sound. I wanted a fast, bright, cutting sound, and I didn't need anything more than this to achieve it. While it may not be glamorous, it fills a niche that my other two larger snares can't. In terms of looks, I colored the chrome hardware black, and so it actually looks quite nice now, too. While it will probably never be my go-to snare, it's a nice third option with a very different voice from the others. One point I am picky about with snare drums is the type of head they use. I have tried a few different heads, but the sound I like is the Remo Ambassador. This is a thin head, but it is also the industry standard. There are many heads available these days, especially for snare drums, but all of them just add different amounts if muffling to the head. The Ambassador produces a classic, bright, pure sound that I can dampen if needed, but rarely do. It reminds me of Stewart Copeland's snare sound on Ghost in the Machine. Every snare drum I've owned gets an Ambassador right away if it doesn't already have one. Cymbals, like snare drums, are something that drummers obsess over and everyone else just thinks they're all a bunch of racket. I have spent more on cymbals than drums, without a doubt. Since I started drumming I've probably owned over 30 cymbals, but rarely more than about 6 at a time. Pictured is my current set of 6. The first cymbals I experienced in person were Zildjians. 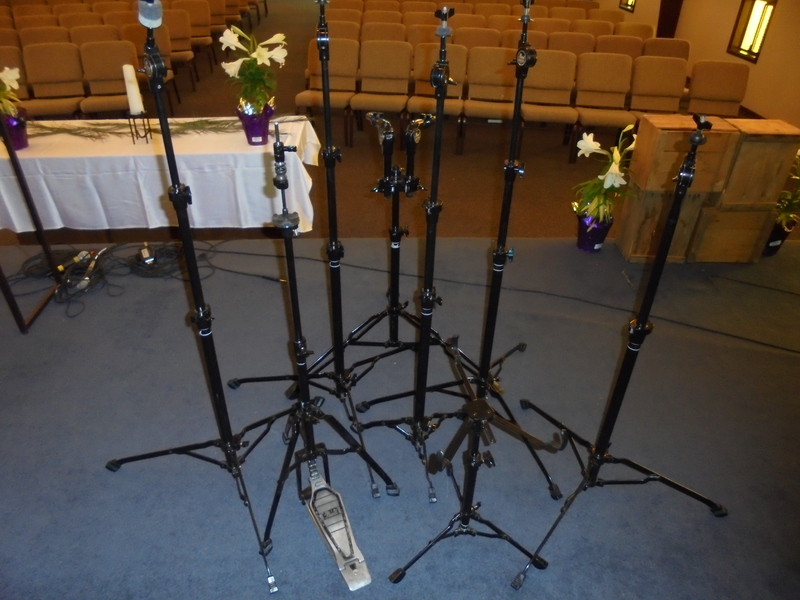 They are very ubiquitous at schools and churches where I first came in contact with drums. When I started buying cymbals however, it became very clear that Sabian cymbals regularly cost much less, probably due to having less brand name. Sabian, as a cymbal company, was started by a Zildjian, and so the cymbals are generally made in the same way. They just cost less. As I said, I've had many cymbals. This particular set was chosen because they are a very "normal" set. I chose medium weights and regular sizes for each cymbal. After trying so many, I've decided that what I wanted was a set that would really work well for a variety of gigs. They might not be my first choice for playing metal in stadiums, but I don't see that happening any time soon. For the smaller stuff that I do actually play, these cymbals will always sound great. These cymbals are mostly of the Sabian Hand Hammered line. 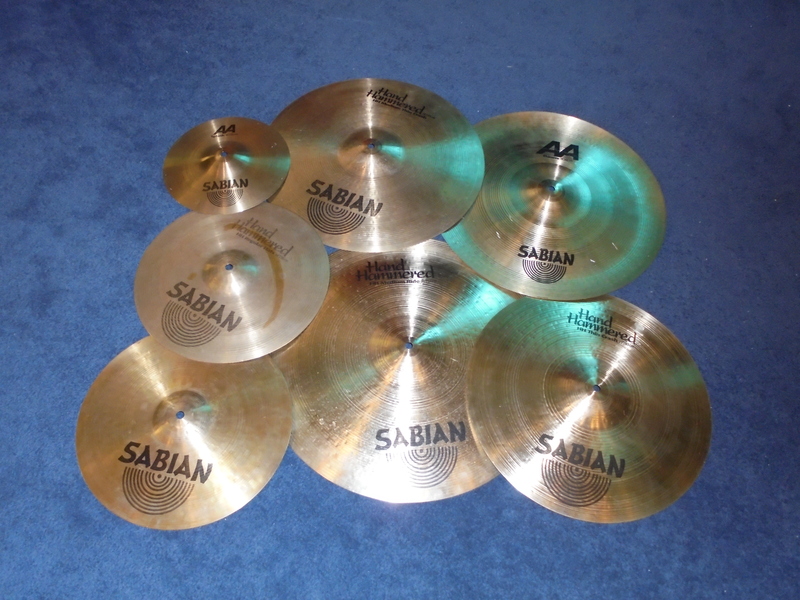 This is a fairly expensive type of cymbal among Sabian's offerings, but when purchased used aren't much more expensive than their sub-professional offerings. These cymbals tend to be very soft, not harsh at all. Jazz players, though I am not one, tend to gravitate towards these cymbals because they are great for quiet volumes. They have a very classy sound to them. I've really liked having a set of 6: 1 pair of hats, 1 ride, 1 splash, 1 chinese, and a left and a right crash. It just seems like it could do anything, and that any more than that is just showing off. I've bought and sold so many cymbals that I don't think I've ever had the same "set" for more than a few years, but this one might just be it. Like snare drums, I want to develop a "signature" sound with my cymbals also, and I want this to be it. The head I use on it is a Powerstroke 3, which is fairly popular these days. Originally, I had a completely unmuffled Ambassador head on it, and it had an absolutely MASSIVE sound. Worked fine in my old rock band, but I'm not sure I could work with it now. The Powerstroke 3 controls the noise nicely, but like I said, I don't lose that sweet WHOMP when I lay into it. The resonant head has no muffling other than the hole cut into it. It was originally also a Powerstroke 3 head, but I actually trimmed away the muffling, and I prefer the sound now. I occasionally put a single towel lightly touching both heads in the drum. 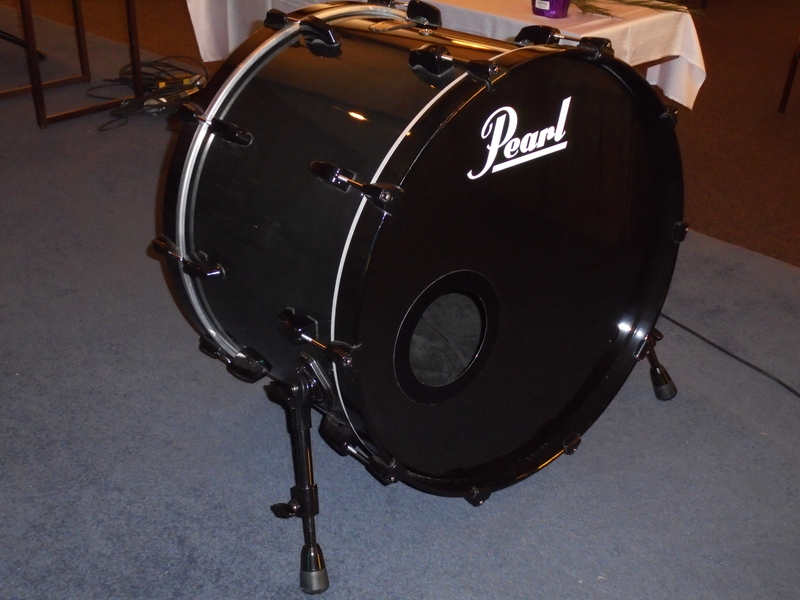 Since I have a larger bass drum, all this muffling doesn't have as large of an effect as it would on a smaller drum. I like to strike a balance between the modern "punchy" sound, and yet still have some warmth and body. This particular combination seems to work best. When I was deciding what sizes of toms to get for my drumset, it was a tough decision. I ended up going with 10"-12"-14"-16" for versatility. The even 2" spread between them makes tuning very easy. Furthermore, they cover all styles of music. There is no style of music that these toms can't fit into. I suppose they are a little on the small side. 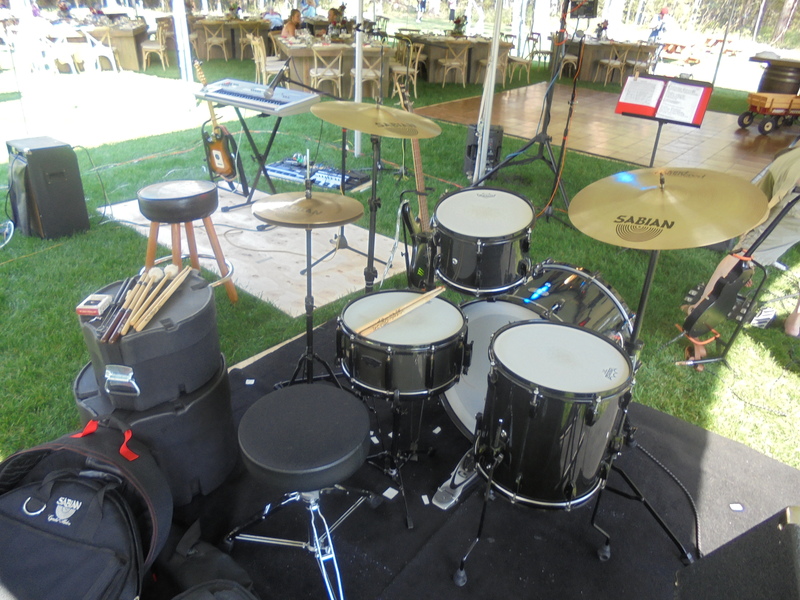 Since I have a large bass drum and a large snare drum, sometimes the toms seem out of place, if only in appearance. The 10" tom, although the one I play the least, was also the most important. Stewart Copeland regularly used one of these for his reggae-influenced fills and the sound is unmistakeable. I knew a 10" tom would be part of my set. The 16" floor tom was a special order. 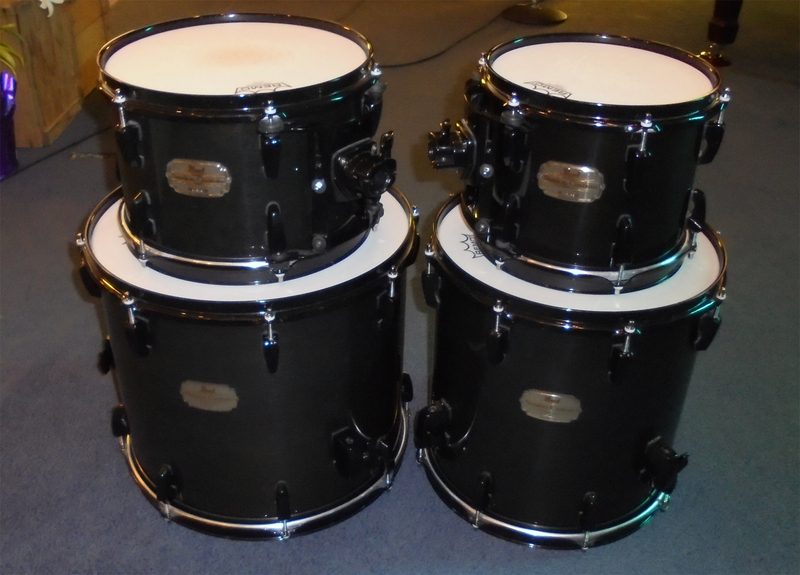 Most 16" floor toms are 16" deep, but I wanted a 14" deep one to match my other 14"x14" floor tom. So I ordered the shell and installed legs myself. I didn't do the greatest job and they're a little skewed. Doesn't affect the sound though, since it still sounds great. When I only use 1 floor tom, I regularly switch between the 14" and 16". My preference is to have them both set up though. 2 floor toms look really cool, and it's also nice just to have more targets to hit! Like snare drums, I use Remo Ambassadors on all my toms. I've never had to mute them with anything. The bright, open sound seems to work in all situations. It's so classic too. The first drumset I ever played on, the one at my middle school, had Ambassadors on it, so I think I've come to associate that with what drums should sound like. I don't really have any interest in using any of the varieties of muffled heads that are available. I've owned top-of-the-line hi-hat stands, expensive snare stands, and lots of different types of cymbal stands. Yet, in the end, the set of hardware I decided on is all cheap and flimsy. No, seriously! What I've discovered is that all the bells-and-whistles of the expensive stuff is unnecessary and that what matters most is weight. I gotta lug all this stuff around! All I want is something to hold my snare drum... the cheap model does that just as well as the expensive one. They both have a tripod base, so it won't fall over even if it's a bit wobbly. Frankly, the wobble is kind of cool anyway. But basically, all I lose is about 5 pounds. Not much in itself, but multiply that across a whole range of hardware and now I'm saving myself 40 pounds of hardware. One benefit to this decision, besides the obvious weight, is that I actually quite like the look of this hardware. The expensive stuff uses thick tubes and has all kinds of stuff coming off of it. I like the simple, slender look of this hardware better, because it doesn't detract from the drums. I've come to realize that the really bulky, modern stuff tends to look like some kind of machine, and less like something used for a musical instrument. Once I had all the pieces in place, I took them to a powder coating place where I got all my hardware stripped of chrome and made black. It was a time-consuming and somewhat expensive process, but it was worth it. Black hardware is pretty unique and cool looking, I think. Some disagree and think basic chrome is "classier," I'm sure. Some parts, however, are worth getting a little more higher-end gear though. Case in point: the hi-hat stand. The stand itself is super lightweight and wobbles a bunch as I play, which is fine. However, the clutch, the part that actually holds the top hi-hat cymbal, was unreliable and would occasionally drop the top hi-hat. So instead of getting a whole new, expensive and heavy hi-hat stand, I just replaced the clutch with a better one. I now use Pearl's quick release clutch, which is both rock solid and also very convenient when setting up and tearing down. Another point of modification is on the cymbal stands: I've stopped using the standard cymbal felts for the most part. Pearl's cymbal stands tend to come with very large, thick, and inflexible felts to go beneath and above the cymbals. The result is that the cymbal doesn't move very much when you strike it. Maybe for some this is a benefit, but I think it looks crappy and it can't be good for the cymbal. I removed all the felts and ordered these rubber parts that Pearl uses in their hi-hat clutches. They only go beneath the cymbal. Because of their small, onubtrusive nature, when I strike a cymbal, they tend to jump and wobble all over! 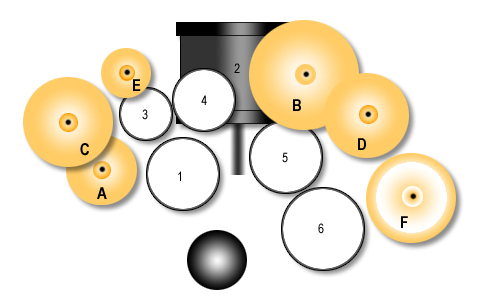 Not only is it a cool visual effect, but it really "frees" the cymbal, allowing it resonate longer and more naturally. Even though drum muffling is very common, I think many people don't realize cymbal muffling is also possible... if you're using the standard felts!